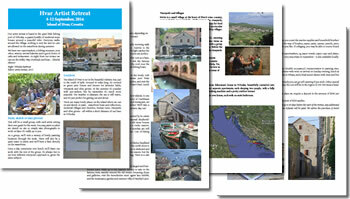 Paint Hvar is taking a sabbatical for this year, but we expect to be back again in future years. In the meantime, artists are encouraged to visit Hvar and spend time painting the beautiful scenery for themselves. The 2016 brochure may give you some ideas for where to find the best painting locations! Also, check out my GoHvar Blog for a day-by-day description of our previous retreats, and from some of our artists on their own blogs, too! If you are interested in receiving information on future art retreats on Hvar, please sign up here.